Upcycle and save money with Kirstie! It’s time time to revamp, repaint and re-polish! Trust us, upcycling is recycling’s cooler cousin. 60% of us Brits want to freshen up our homes with simple, cheap changes. 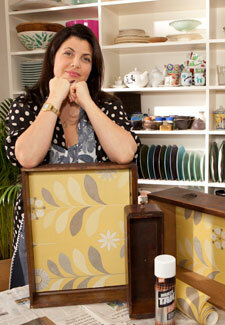 So for creativity on a budget Kirstie Allsopp is our woman. For more tips and tricks, B&Q and Queen of homemade Kirstie have created new YouTube how to films, which are chokka with handy tips and creative cheats, such as lining your tired drawers for a quick upcycle update. Paintbrushes at the ready, get recreating!